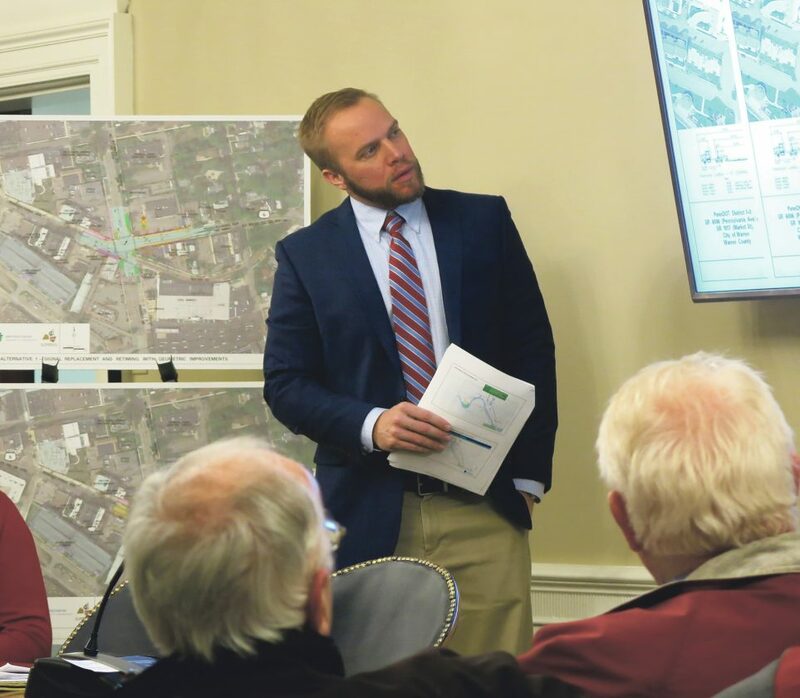 Times Observer photo by Brian Ferry This graphic presented by PennDOT during a special meeting Monday night of Warren City Council shows two possible roundabout configurations. In blue, the original 130-foot radius roundabout, and in red, a possible 150-foot roundabout. Times Observer photo by Brian Ferry Engineer for Design Brian McNulty points to PennDOT’s data in attempt to address safety concerns. 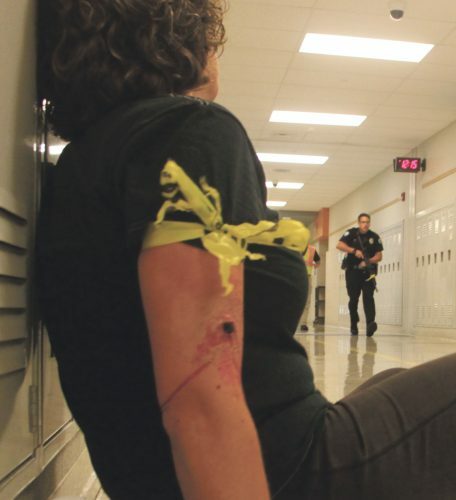 Several in attendance questioned the accuracy of the data. There’s one more round left for the roundabout decision. The final decision is being held up by rescission. The roundabout issue will only be before council for one more week, according to Mayor Maurice Cashman. At a special Monday night meeting of Warren City Council, Council Member John Lewis, who was not on council at the time the original vote on a roundabout at Market Street and Pennsylvania Avenue was approved, made a “notice of rescission” to put the matter back on the table at next week’s regular meeting of council. The meeting was attended by more than 30 citizens, several of whom expressed views in opposition to the roundabout for a variety of reasons. The concerns included the safety of tractor trailers trying to make some of the turns, the safety of pedestrians — including youth, the handicapped, and those of limited mobility, infringing on nearby properties, PennDOT’s data, the amount of time the intersection would be limited by construction, and the costs of the project. A bevy of PennDOT representatives — Project Manager Chris Boyer-Krantz, Assistant District Engineer for Design Brian McNulty, District Executive Jim Foringer, Traffic Engineer Brian Smith, and Design Services Engineer Tom McClelland — presented information and fielded questions throughout the meeting. They said they were not married to the idea of a roundabout, but that it was the preferred option. “We do think from a 20-year standpoint that the roundabout will provide a higher level of service,” Foringer said. “Why this rush to judgment?” Lewis asked. He suggested a county-wide referendum could be placed on the ballot in November to get the opinion of the people. McNulty and Foringer explained that there was some time pressure regarding the intersection. Foringer was more specific. He said the department would like to have the decision in February but could accept one no later than March. Whether the city approves the roundabout or goes with an improved signaled intersection, there is plenty left to be done. Even the size of the roundabout that was presented to council in August — 130-foot diameter — could be changed eventually. “This was never intended to be a final design,” McNulty said. 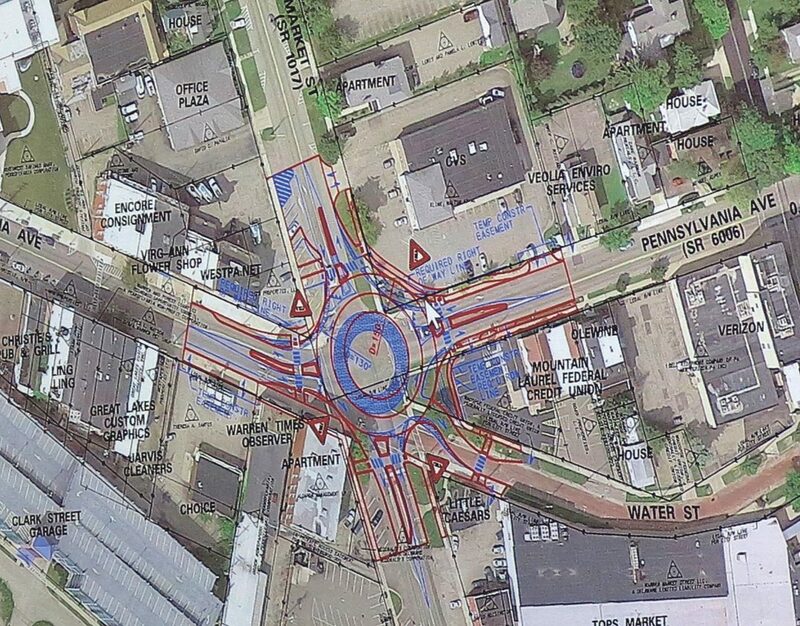 PennDOT was comfortable with that size as a minimum, but if city officials would prefer a larger roundabout, one of 150 feet would fit, but require more negotiations for land from neighboring owners. And, it would negate some of the “traffic calming” benefit of a smaller roundabout, Boyer-Krantz said. Once design is complete, PennDOT has a project timeline of three primary phases over about seven-and-a-half months. During that time, much of the intersection will remain open. Work on the southern half of the intersection would take about four-and-a-half months. The northwest quadrant would follow for two months. The northeast quadrant would also take about two months. The fourth phase of the project would not restrict traffic and involves landscaping and lighting, Boyer-Krantz said. Lawrence Jackson of Conewango Township said he had investigated crashes for most of three decades with the National Transportation Safety Board. Jackson said a gasoline truck “will turn over at 16.5 miles per hour” at a “50-foot radius” similar to the roundabout’s. “All our engineering shows that if they’re traveling at a safe speed, it’s safe to navigate the roundabout,” Foringer said. Council Member Paul Giannini was one of those who questioned the data. He suggested that PennDOT break out statistics for roundabouts in a downtown setting instead of showing the statistics for both city and rural roundabouts. Others questioned traffic and pedestrian data after an error was pointed out in a part of the presentation. One citizen, Aaron Stearns, asked about the process of the rescission notice. Stearns asked why that couldn’t happen again after the next meeting.